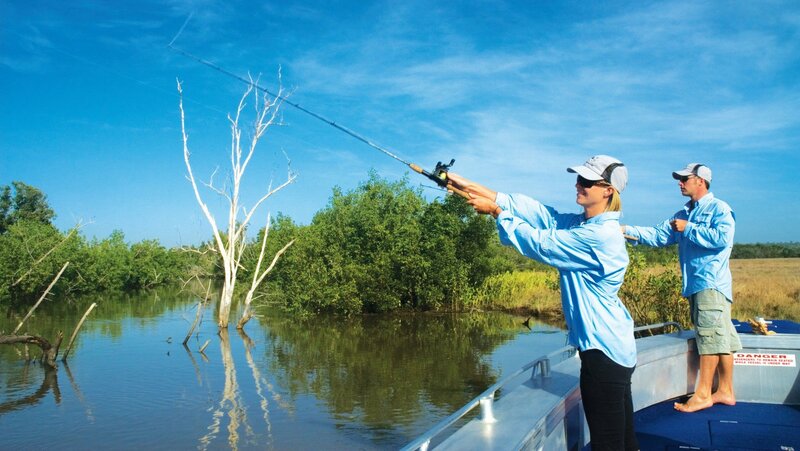 Through an exclusive lease with traditional Melville Island land owners, Melville Island Lodge offers sport-fishing access to five magnificent and barely touched river systems; Snake Bay, Shark Bay, the Johnson and JessIe Rivers, and famous Goose Creek. 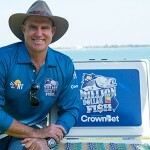 Add to this a wide variety of smaller coastal creeks and inlets, plus a virtually untouched range of coastal and off-shore fishing options, and it’s easy to understand why the waters in and around Melville Island truly are an anglers paradise. 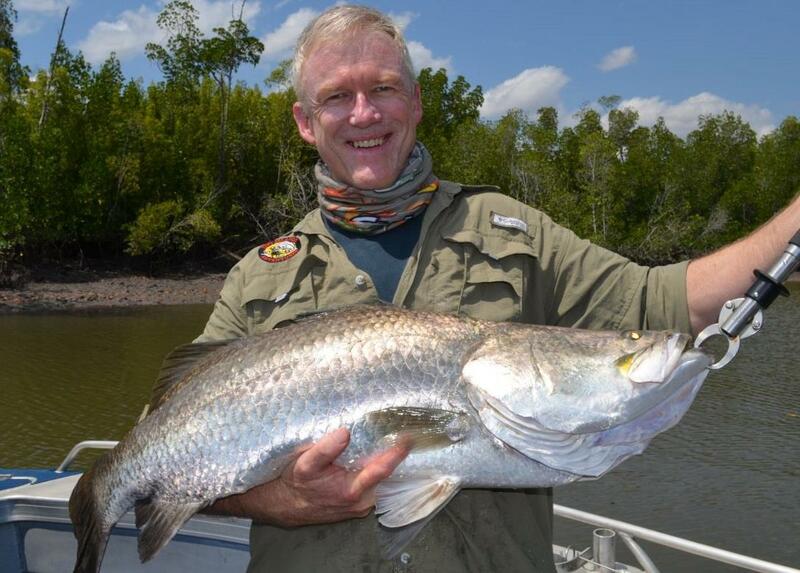 Barramundi are prolific throughout the Melville system and are caught in good, often large, and sometimes very large numbers around fallen trees, gutters, creek mouths, rock bars and sand flats. 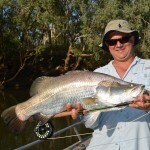 Barramundi are caught all year at Melville Island, and are traditionally most active during the warmer periods of March-May and September–December. 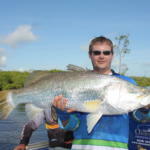 Many trophy sized barra in excess of one meter and 20kgs are caught (and released) by clients each year. 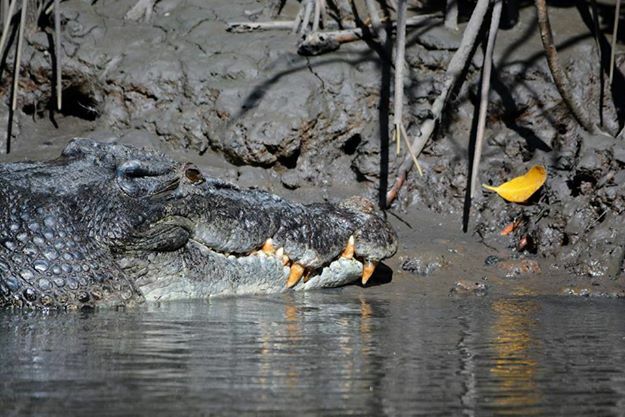 Whilst Barra rre one of the most sort after species, there’s a lot more to fishing Melville Island than just barramundi. 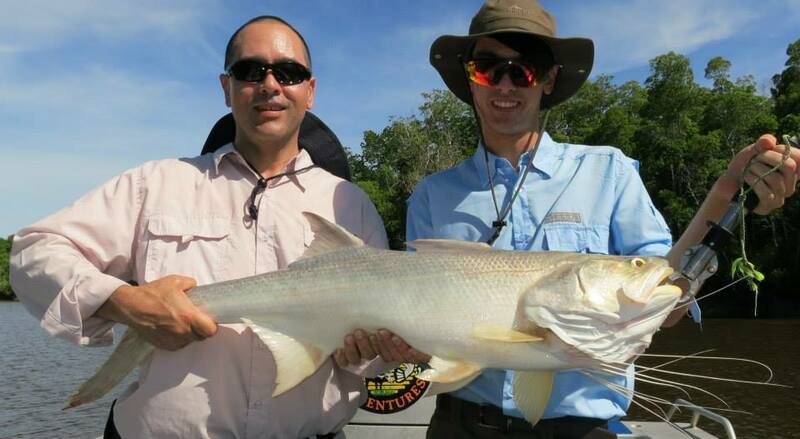 Other species prolific in the river systems include mangrove jacks, threadfin and blue salmon, saratoga, fingermark, tarpon and estuary cod. 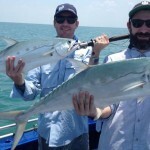 Plus, off-shore there are spanish mackerel, black jewfish, golden snapper, queenfish, giant trevally, coral trout, long tail tuna and many other species. So far 30 species of quality fish counted in these waters and they are regularly encounter in good numbers and sizes. Yyu don’t even have to travel far to catch them , as some of the areas most productive fishing grounds are a mere 10 minutes traveling time from the lodge. 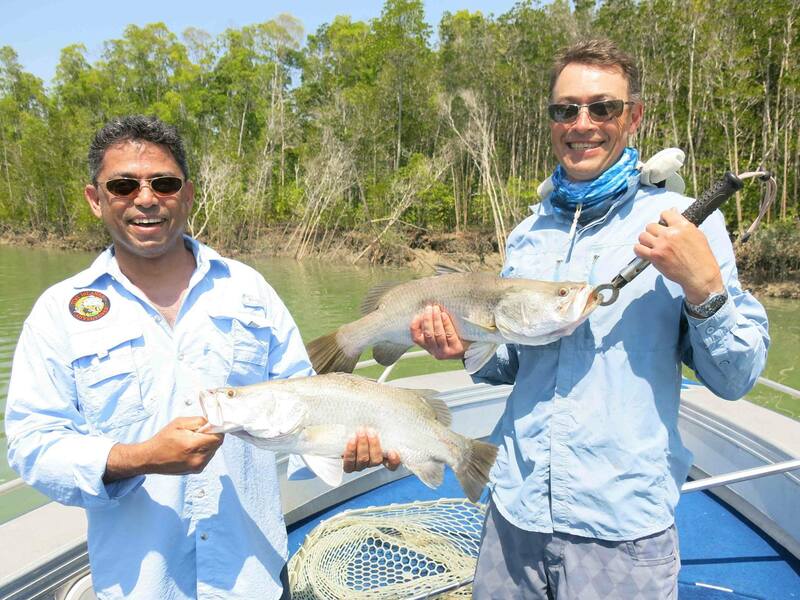 Being a ‘sport-fishing’ destination Melville Island Lodge actively promotes ‘Catch and Release’ fishing. 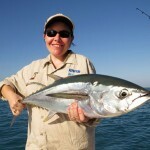 This means that all fish caught, that are surplus to the immediate requirements of the Lodge, are released. 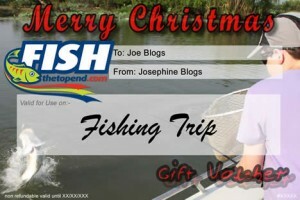 Naturally, if you’d like to take a few fresh fillets home with you as a memento of your trip, you are most welcome to do so. Otherwise, and apart from a few select fish we take for evening meals, all fish are freed unharmed to fight another day and to be caught again on your next trip. 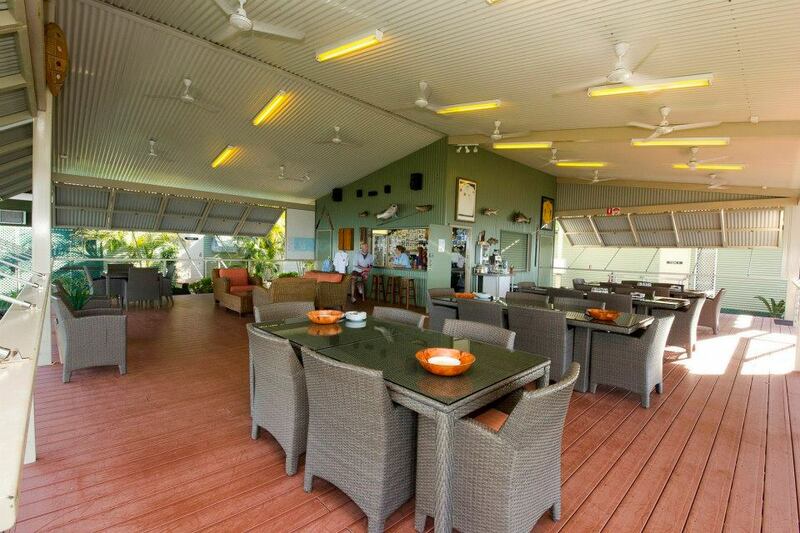 The Lodge is situated on the fringe of Milikapati, a friendly Melville Island township, which is also known as Snake Bay. 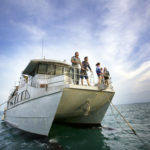 The purpose-built Fishing Lodge, which is arguably the best located and most comfortable tropical fishing destination in the Northern Territory, is positioned high on the waters edge with sweeping views over beautiful Snake Bay and the Timor Sea. The Lodge is limited to a maximum of 15 guests, enabling the experienced team to provide you with a superior level of personalised service and attention designed to make your visit enjoyable, thoroughly relaxing, and with the very best and most productive fishing experience possible. But, getting off the beaten-track doesn’t mean having to go without, because the lodge has 240v power, hot showers, flushing toilets, phone, fax & email access (if you need it), plus a wide range of other day to day ‘normalities’ and creature comforts seldom associated with remote fishing destinations in the Northern Territory. The main building is the centre of activity at the lodge and houses a spacious, well appointed and comfortable indoor-outdoor dining area, licensed bar, guest lounge area and other facilities. Open to cooling sea breezes, with magnificent 180 degree river and ocean views, the main building is the perfect place to relax after your day on the water. The main building also offers 24 hour guest access to tea & coffee making facilities, cold drinks and snacks. Surrounding the main building are the guest rooms. The comfortable air-conditioned rooms are a combination of twin and triple-share occupancy cabins with queen size and/or king-single beds. Adjacent to the cabins are the guest bathrooms which include a private ladies bathroom complete with its own toilet, shower and dressing area. The Lodges fleet consists of six custom-built 6.6 metre aluminium boats, fitted with 150hp four stroke motors. 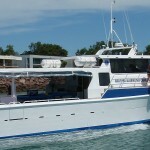 All boats have colour sounders, GPS, satellite phone, 2 way radio, first aid kit and full safety equipment. All boats also have carpeted floors and a spacious forward casting platform and are fitted with rod storage racks, gear lockers and comfortable padded swivel seats. 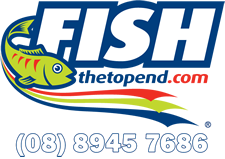 Other standard on board equipment includes a large ice box, cold water dispenser and, of course, an expansive range of fishing tackle and equipment. Boats are large, high-sided and purpose-built to provide the safest and most comfortable platform possible in the waters you will be fishing. 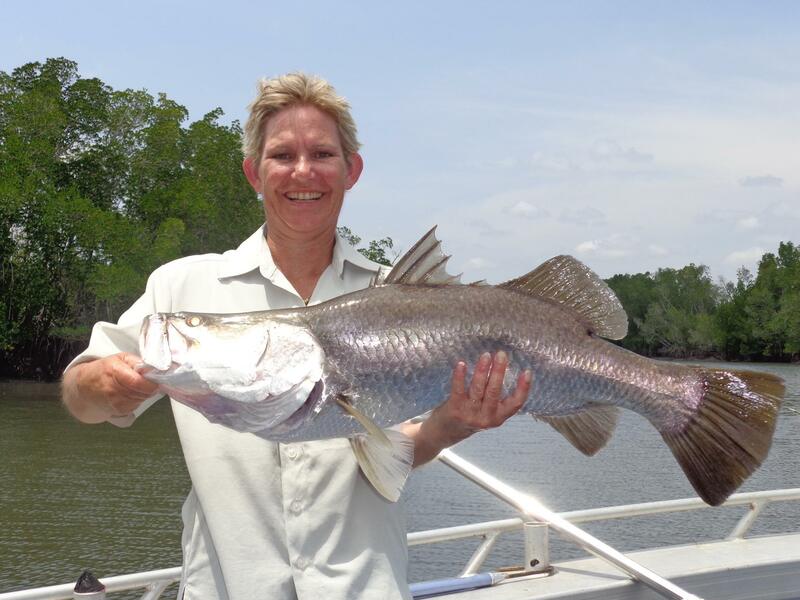 At Melville Island Lodge you will exclusively focus on lure fishing in the rivers and creek systems, which mostly involves lure casting, occasionally trolling, a combination of fallen trees, creek mouths, rock bars, sand flats and submerged gutters. Standard tackle for this style of fishing comprises of a light-medium action graphite fishing rod of around 1.7m in length with a light weight single-hand ‘bait-caster’ style fishing reel spooled with 10-15kg breaking strain braided fishing line. Types of lures used include shallow and deep diving minnows and soft plastics. 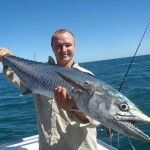 Off-shore and coastal fishing involves a combination of lure, “soft plastic” and bait fishing with standard tackle comprising of a medium to heavy action rod of 1.5m in length with an ‘overhead’ style fishing reel spooled with 25-30kg braided fishing line. 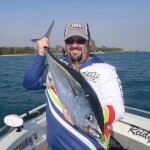 For fishing Melville Island, pack shorts or lightweight long pants, together with lightweight shirts, preferably long-sleeved if you sunburn easily. Bring boat shoes or something similar for your feet plus a wide-brimmed hat. 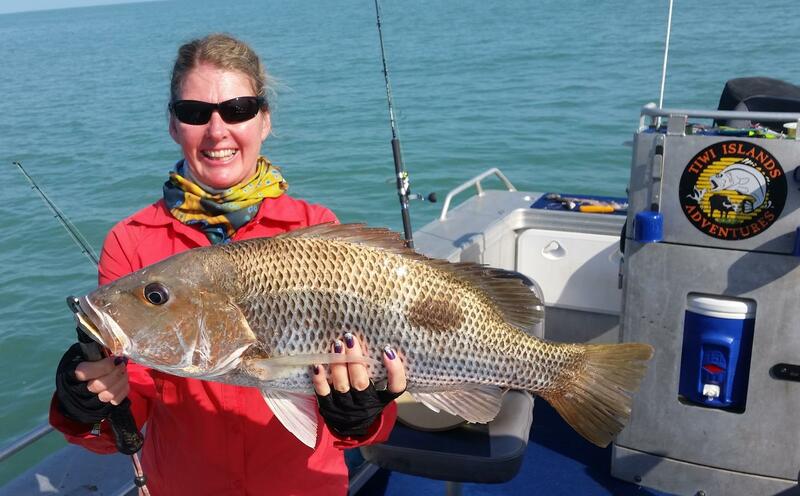 Sunglasses are a necessity, Polarised are best for spotting fish, if you have them. 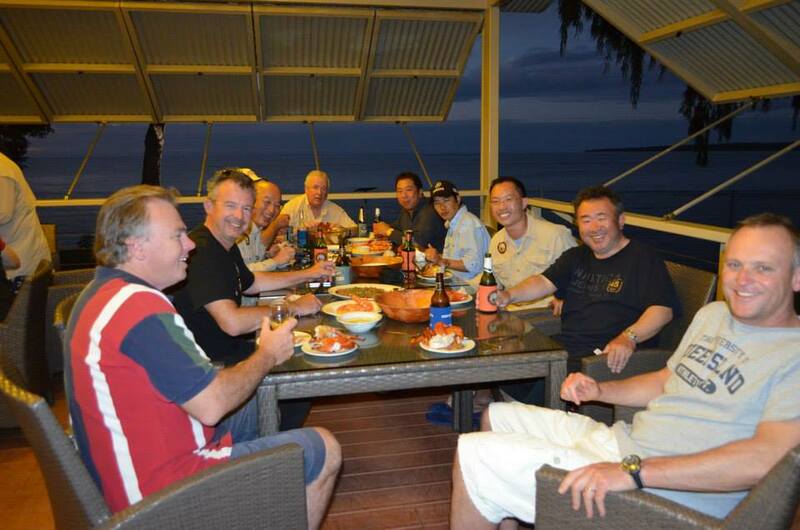 Our lodge is extremely relaxed and casual, so shorts, tee shirts etc. are perfect for non fishing times. If your trip is between June and September it may also be wise to pack a lightweight sweater or something similar, as early mornings and evenings can occasionally get a little chilly at this time of year. Please also bring any other personal items you’ll need for your time away. Such as sunblock, insect repellant, cosmetics, personal medications, cigarettes etc. Remember, you’ll be in a remote environment, and although there’s a general store at Snake Bay, it’s opening hours and range of goods is limited. There are two flights into and out of Melville Island Lodge every day, giving you the choice and convenience to commence and finish your fishing trip early morning or late afternoon.